Coffee drinkers rejoice! We live in a time where no camping excursion, road trip, or major power outage can stand between us and our precious brew thanks to remote brewing coffee makers. These machines give us the freedom of bringing our cup of joe wherever we go, so we never miss a cup. Today I will highlight the best coffee makers for remote brewing. My choices are based on the online reviews of a group of people I affectionately call the coffee brigade that has purchased the brewers and care enough to share the very best. Let’s get started! While it might not brew the perfect cup, it still needs to be a good one. That means it tastes fresh and smooth and doesn’t produce a diluted cup of joe, a.k.a. water that tastes like coffee, but isn’t coffee. Since it’s designed for those on-the-go, it needs to be lightweight, compact, and sturdy enough to endure travel conditions. Your brewer should be easy to use and clean each time you brew a cup. When over 4,239 Amazon reviewers give a portable coffee maker an average rating of 4.7/5 stars, you know it’s worth a try. This AeroPress French press method of brewing gives you greater control over the brewing process by allowing you to steep it according to you taste preferences, adjust the coarseness and a number of grinds, and it helps more efficiently regulate the temperature of your cup. Reviewers rave about how great their coffee tastes using this method. Some love it because they can create their custom cup, others appreciate the fresh, bold taste without any bitterness, while more just find it super convenient whether they use it at home or on-the-go. 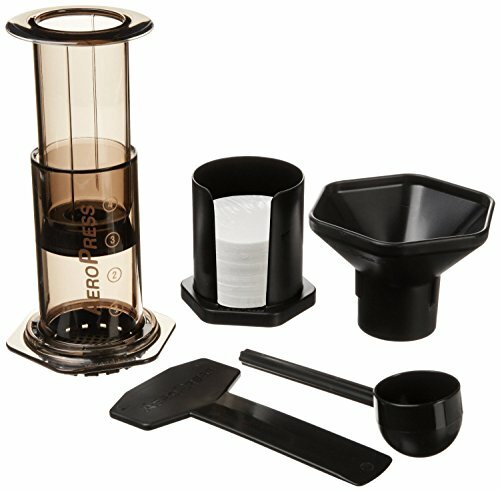 If you are on the fence as to whether you should give Aeropress a try, just read through some of the reviews on Amazon to find out why so many people gave it such a high rating. The only negative comments I came across had to do with the process. Some didn’t feel coordinated enough to execute it properly while others wanted more cups per brew. This brewer is ideal for: Anyone who enjoys a quick French press at home or on the go. While it is perfect for people who enjoy camping, this portable solution allows anyone a more fresh, refined coffee experience at home or work. Instead of pouring stale coffee from an hour-old carafe, this brewer gives a fresh cup each time. 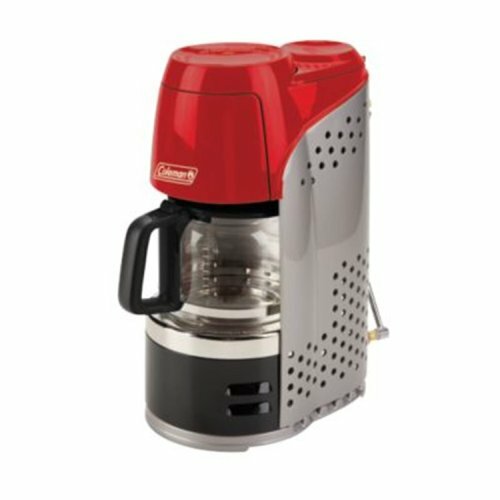 The Coleman Camping Coffeemaker is ideal for, you guessed it, campers. Anyone who finds themselves outside with a 2-3 burner stove can use the Coleman Camping Coffeemaker to brew the same cup of coffee they are used to in the comfort of their own home. While most of us are used to putting our carafe brewer on a counter, the Coleman Camper is placed directly on a propane stove pot, needing at least two, maybe three, burners to heat up the water to brew. Once the water is heated, it will work its way through the machine to brew the coffee typically within ten minutes. It features a pause and serve option, so if you can’t wait ten minutes, you can grab a cup and the machine will stop dripping until the carafe is put back. My coffee comrades love how easy it is to brew a cup using the Coleman Camper and enjoy having that homemade cup of joe on the go. Some said it took longer than ten minutes to brew, which prompted other reviewers to note that it will take longer to brew if the water isn’t cold enough. Some reviewers were also disappointed that this portable coffee maker comes with a glass carafe. 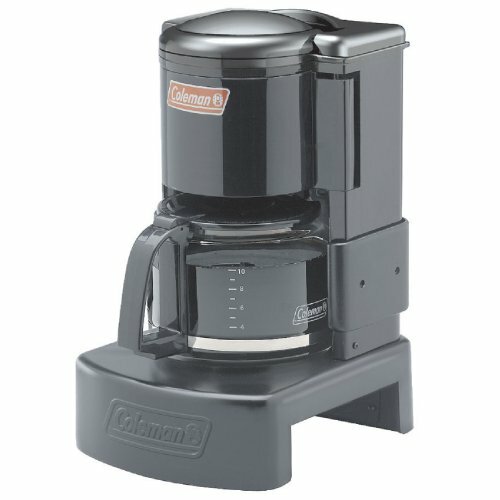 Coleman does offer a stainless-steel carafe at an additional cost. This portable brewer is ideal for: anyone with a love of coffee and a propane stove to brew it. Cool, right? This machine comes with a glass carafe, but there is a stainless-steel carafe available. It features an “Instastart” ignition for push-button, matchless lighting and its PerfectFlow technology provides consistent, reliable performance no matter the brewing environment. The brewer will continue to warm the coffee up to 4.5 hours on high using one 16.4-oz. propane cylinder. Most reviewers agree this is an easy machine to use and makes a good cup of coffee. One complaint is that since it is designed for brewing outdoors, it should feature a stainless-steel carafe instead of a glass one that may break in transit. Many remarked how they purchased this brewer after having success with the Coleman Camping Coffeemaker simply because they wanted to free up the burners on their propane stove. Reviewers also liked how the machine kept their coffee warm long after brewing. This portable brewer is ideal for: anyone who enjoys camping, tailgating, hunting, or any other outdoor activity that pairs well with coffee. I wanted to find a brewer for those on the road; especially truck drivers who would much rather a fresh cup of coffee over the gas station variety, and to be honest, they are hard to find. The Roadpro is one of the only car adapter-based machines that had enough decent reviews to warrant a mention here. It features a stainless-steel travel mug, an easy-to-clean reusable filter, and a stop-drip mechanism, so you won’t make a mess removing the mug after brewing. This coffee maker will brew your coffee, it just takes about fifteen minutes and will only produce 16 oz., or the equivalent of a medium or large cup of coffee. For less patient folks, especially those that can’t start their day without first drinking coffee, this might not work for you. Many said this brewer makes a good cup of coffee. This portable brewer is ideal for: patient coffee-loving truck drivers or someone on a stake-out with time to kill. The Makita DCM500Z LXT Lithium-Ion Cordless Coffee Maker runs off an 18V Lithium-Ion battery which must be purchased separately (crazy, I know) so before you hit buy now, make sure to add a battery and charger to your basket so it will work. Another thing to keep in mind is that a fully charged small Makita battery will only brew up to 3 5-ounce cups of coffee on a single charge of an 18V LXT 5.0Ah battery. 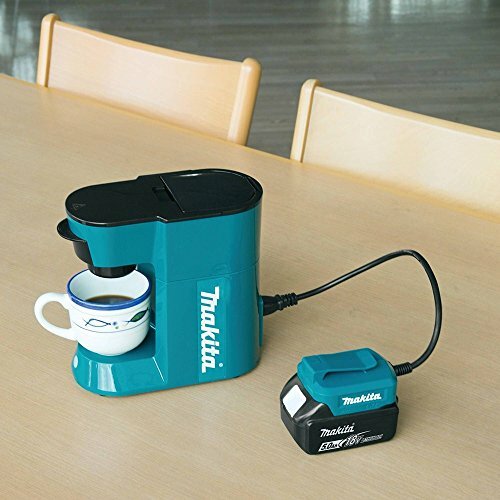 The Makita battery received rave reviews from people that purchased from Amazon, and it should be noted that this battery and charger can do more than help you brew coffee; it can charge up to 2 USP compatible electronic devices where AC power is not available. 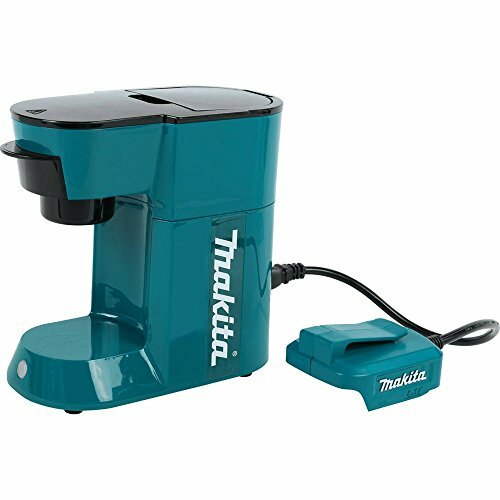 The Makita brewer features a cord as well, and its website says it will brew one 5 oz. 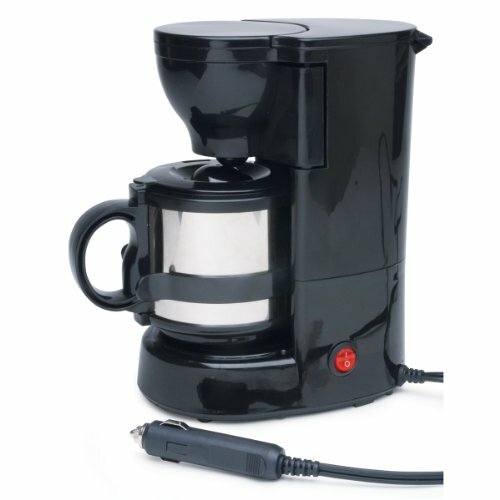 cup of coffee in 3 minutes using power from an outlet versus 7 minutes to brew using an 18V LXT battery. This portable brewer does not require paper inserts, and its reusable filter is easy to remove and clean. Most reviewers say they like the coffee and it’s worth the wait. The major drawback is the amount of coffee it brews, but for those that just need that one cup while away from their traditional brewing system, this works well. There were some people frustrated about the additional cost of the battery and charger, but others who liked having the additional power source available to charge other electronics when it was not used to make coffee. This portable brewer is ideal for: people who want the option of using traditional AC power or a battery to brew no matter where they decide to enjoy a cup. Whether you want to brew from your backyard or high up on a mountain somewhere, these portable coffee machines can help you create the cup you want, where you want it. I hope you found the best brewer for you! 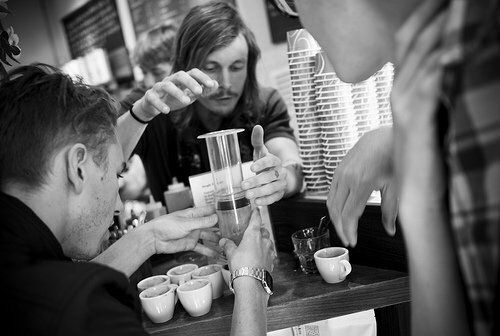 Previous Post: « Coffee Knowledge 101: What is a Macchiato?